If one of the supply line is disconnected due to open circuit or improper contact in switch then still the motor continues to run. The power is then supplied to the remaining windings. The current in the other phases increases to about √3 times its normal value. This is called single phasing which results in unbalanced stator currents. The component which is present in this unbalance current called negative sequence component causes magnetic flux rotating in opposite direction to the main flux. 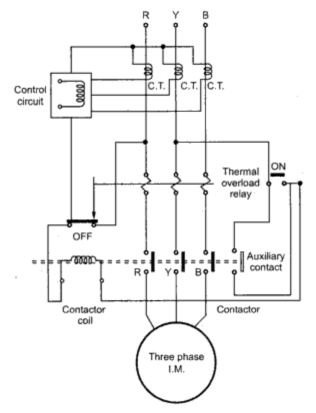 This results in double frequency current to induce in the rotor cause its heating. Thus major damage to motor may take place due to single phasing if proper precaution is not taken. As the phase overcurrent relays react slowly, they can not give the instantaneous protection against single phasing. For small motors separate protection against single phasing is normally not provided as thermal relays sense the increased current in remaining phases due to single phasing and provides the sufficient protection. A separate single phasing protection circuit is required in case of large induction motors as even a small unbalance can cause damage to motor winding and rotor. The single phasing preventer is shown in the Fig. 1. As shown in the Figure, it consists of C.Ts connected in each phase. The output of control circuit is fed to the level detector which sense the magnitude of unbalance. Depending on this output from the control circuit the tripping command to the starter or the circuit breaker is given when negative sequence current exceeds its preset limit.